Here’s another example of simply claiming something and repeating it as if it were true so that people will just assume it is. During the last presidential campaign there was a video of a woman, who normally would have no credibility judging from her presentation, screaming that she wanted to vote for Obama because he had given her a phone. She became a viral internet video sensation, and proof offered by the right wing media and politicians that the president was buying votes by spending taxpayer money. The program is not funded by the government or taxpayer money. And it’s hardly new. SafeLink Wireless offers eligible low-income households a cell phone with about one hour’s worth of calling time per month, along with other wireless services like voice mail. Applicants have to prove that they are either receiving certain types of government benefits, such as Medicaid, or have household incomes at or below the poverty line. The program is run by a subsidiary of América Móvil, and it is not paid for by taxpayer money as it is funded through the Universal Service Fund administered by the Universal Service Administrative Company, an independent, not-for-profit corporation set up by the Federal Communications Commission. It is sustained by telecommunications companies such as long distance companies, local telephone companies, wireless telephone companies, paging companies, and payphone providers. It is that universal service fee that appears on a phone bill and which most people pass over without question. Originally each phone company had its own system that did not allow people on one company's system to call someone on another. So in 1913, AT&T committed itself to resolving interconnection problems as part of the "Kingsbury Commitment." Later, in 1934 the Telecommunications act created the FCC which, among other things, made available “so far as possible, to all the people of the United States, a rapid, efficient, Nation-wide, and world-wide wire and radio communication service with adequate facilities at reasonable charges”. The new FCC was tasked with promoting this principle of "universal service." Later in 1996 the Telecommunications Act was modified to create the Universal Service Administrative Company (USAC) to "ensure all Americans, including low-income consumers and those who live in rural, insular, high cost areas, shall have affordable service and [to] help to connect eligible schools, libraries, and rural health care providers to the global telecommunications network." Since 1997, USAC has provided discounted land line service to low-income individuals, and when cell phones became a major means of communication it began funding programs that provide wireless service, such as the pre-paid cellular SafeLink program. The present program, conveniently and purposely misnamed “Obamaphones” for political reasons, started under President George Bush, with grants from an independent company created under President Bill Clinton, and was a legacy of an act passed under President Franklin Roosevelt, influenced by an agreement reached between telecommunications companies and the administration of President Woodrow Wilson. 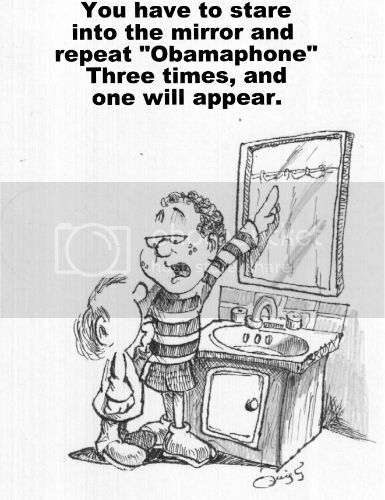 Obviously, these are not “Obamaphones”, but rather “Wilson-Roosevelt-Clinton-Bush-phones”.